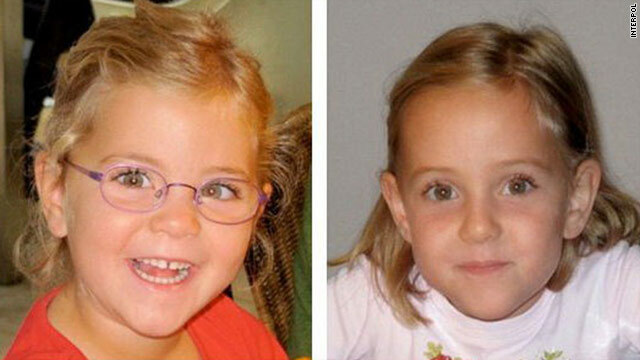 Police say 6 year-old Alessia and Livia Schepp were taken from their home near Lausanne in Switzerland on January 30. Newspaper quoted letter as saying the twins "have not suffered"
Paris (CNN) -- The father of missing Swiss twins sent a letter to his wife saying he had killed them before committing suicide, police said Friday. Matthias Schepp, 43, also studied suicide techniques, poisons and ferry schedules before allegedly taking 6 year-old Alessia and Livia Schepp from their home St. Sulpice, near Lausanne in western Switzerland, on January 30, according to police in the Swiss canton of Vaud. The girls were spotted on a ferry to the island of Corsica the next day, but there have been no confirmed sightings since, according to investigators. A bar owner in Cerignola in southeastern Italy reported seeing a man with a northern Italian accent taking his daughter to the restroom, according to Rai Uno TV, which added that a police review of the bar's video doesn't support claims the man was Schepp. Schepp killed himself by stepping in front of a train in Cerignola on February 3, a spokesman for the Swiss police said this week. Authorities did not release the contents of the letters, but the Italian newspaper Corriere della Sera published a sentence it said was from Schepp's last letter, dated the same day he committed suicide and mailed from Bari, which is also in southern Italy about 60 miles (100 kilometers) east of where his body was found. "The children rest in peace, they have not suffered," the newspaper quoted the letter as saying. It is possible that Schepp killed the girls on the ferry to Corsica and threw their bodies overboard, Jacques Dallest, a French prosecutor, said earlier this week. In addition to the alleged confession, the letters -- eight in all -- contained about 4,500 euros, police said. Two more letters, containing 1,500 euros, were found in a postal box that was no longer in service. Police learned of the letters on February 8, but did not tell the public to avoid complicating the search for the girls, according to a police statement. In addition to the letters, police said searches of Schepp's computer revealed that he looked up information about firearms two days before allegedly taking the girls. The next day, he searched for information about poisoning techniques and ferry timetables, according to a statement on the website of the Vaud Cantonal Police. "The information shows that the father had planned the trip in detail," according to the police statement. Valerio Lucidi, the twins' uncle, said in an interview with Rai Uno TV that "the fact that everything has been planned for days is really worrying." Swiss police searched the St. Sulpice home three times and investigated 60 other homes in the neighborhood, Vaud police said. They also searched the father's four boats at the ports of Morges and Vidy as well as other ports in the region. Police have contacted all service stations between St. Sulpice and the Swiss city of Geneva, monitored all customs posts in the Geneva region, and hired a helicopter to search the lake near St. Sulpice. Police are now searching for the girls in Corsica, while the investigation in Switzerland is examining the family situation and the father's private and professional life. Police have said Schepp took the girls following family problems, but police said they aren't aware of any evidence suggesting Schepp was having an affair. CNN's Saskya Vandoorne in Paris contributed to this report.